Rangers and leaving behind debris and human waste. birds, and the dark of a night sky unsullied by city lights — are sacrosanct. that might degrade them. But the Bush administration has a different view. up to 4,000 years old. Imagine these stately trees felled to make roof shingles. equipment into privately operated ranches without permission or notification. quality of our lives in inextricably linked to the preservation of our natural habitat. park’s several hundred buildings are in poor condition. State because bridges and trails need repair. and the neighboring Eisenhower National Historic Site are in poor or serious condition. Park in South Florida are unsafe. which affects water that flows into lakes. residents a day who create a daily new demand for 200,000 gallons of water. Hawaii is being allowed to sink. The crush of human traffic has left a trail of ravaged vegetation and human excrement. provide security at the dams. Pollution that has drifted scores of miles into parks is affecting visitors, plant life and wildlife. government puts in place pollution controls aimed at clearing the air by 2064.
visited park, has air quality similar to that of Los Angeles. natural resources, mostly from pollutants from coal-fired power plants. the Environmental Protection Agency said. last 50 years, said Theo Spencer of the Natural Re-sources Defense Council (NRDC). threaten hiking, fishing and other recreational activities” in the parks, Spencer said. wilderness protection, unspoiled vistas, and wildlife conservation. recreation. Housing de-velopments and strip malls are springing up just outside of parks. the pristine silence in some parks. neighboring Grand Teton National Park. sites such as Manassas Battlefield Park in Virginia. Convenience stores, strip malls and shopping centers line the roads to many parks. Traffic piles up, aggravating visitors and residents alike. and Yosemite in California, reduce star visibility and can affect nocturnal wildlife. and a maintenance backlog of up to $7 billion. from Congress or input from the public. 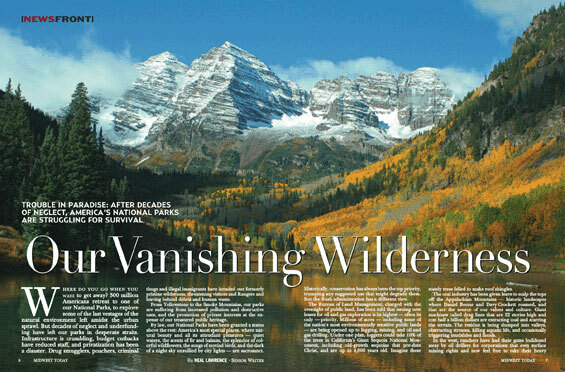 the criteria for wilderness designation and protection can no longer be managed that way. up of streams and rivers in which depleted stocks of salmon are struggling to hang on. or survive legal challenges, even in courts packed with Bush-friendly judges. for Lakota Sioux elders including Crazy Horse and Black Elk. government workforce does a fine job at a fraction of the cost of private corporations,"
Roosevelt and restore its traditional ethic of environmental stewardship. preaching the Biblical imperative of environmental stewardship to his congregation. their coal, some evangelicals are relying on scripture to battle Big Coal.